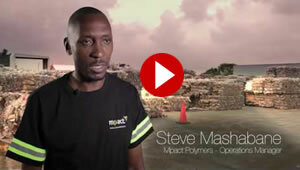 Mpact Polymers enjoys the highest internationally recognised standards. Mpact Polymers is a state-of-the-art plant equipped to produce recycled PET, Savuka (Zulu for "revival"), for food and beverage packaging. The plant will process approximately 29 000 tons of PET plastic bottles a year, generating 21 000 tons of recycled raw material. PET bottles are sourced from Mpact Recycling branches around the country from what was previously considered waste material that would have been sent to landfill sites. This bottle-to-bottle plant is well supported by our industry partner, PETCO. Mpact Polymers enjoys the highest internationally recognised standards. It is the first plant in Africa to meet The Coca-Cola Company's full certification for PET bottles to package the company's soft drinks. The recycling process also complies with European Union (EU) Food Safety Authority specifications. Strategically situated in Wadeville, Gauteng, in close proximity to the Mpact PET manufacturing plant, Mpact polymers further strengthens ongoing benefits to customers, suppliers and consumers. Being both innovative and environmentally friendly Mpact's carefully planned entry into PET plastic recycling is an opportunity for the company to contribute to job creation and enhance its environmental stewardship efforts by helping reduce waste going to landfill sites and, CO2 emissions. Mpact Polymers is able to take full advantage of the existing recycling network and reduce cost of recovered fibre by leveraging existing infrastructure in the collection and recycling of PET bottles in South Africa. As an alternative to virgin PET and backed by the required skills, experience and infrastructure, Savuka showcases Mpact's extensive experience in working with stakeholders to promote innovation. Savuka is the embodiment of our promise to you: Smarter, sustainable solutions.